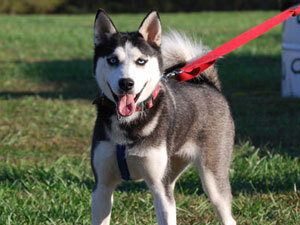 Kya is a happy, high-energy ten-month-old Siberian puppy that just wants to have fun! She loves long walks, running in the park (on leash of course) and car rides. She is playful with everyone and already knows sit, give me paw and get in crate. Kya is a typical Siberian puppy and will chew and jump up on people. She will need somebody that will be devoted to her and her training as she matures. She is crate trained and should be crated when left alone. If you are up for the husky challenge, consider this sweetie. Due to her high energy level and tender age, she will be best placed in a dog/sibe savvy home with a secure, fenced yard to play in with another canine playmate. A tired husky pup is a good pup!